Dr. Shofner offers Raindrop® to patients with presbyopia. Raindrop® Near Vision Inlay improves near and intermediate* vision by simply reshaping the front part of the eye. Raindrop is a small transparent disc called an inlay. In a quick, LASIK-like procedure the Raindrop is designed to help you regain your near vision without the need for reading glasses. *Intermediate vision was measured in the pivotal clinical study, but it was not an endpoint. Extensive trials and usage show that the benefits outweigh the risks. The Raindrop is approved by the US FDA. The Raindrop Inlay is bioengineered to facilitate the transport of nutrients through the cornea. As anyone who has struggled with the on and off hassle of readers knows, having the ability to focus on the details of life is priceless. Raindrop® Near Vision Inlay improves near and intermediate* vision by simply reshaping the front part of the eye. Raindrop is a small transparent disc called an inlay. In a quick, LASIK-like procedure the Raindrop is designed to help you regain your near vision without the need for reading glasses. Raindrop® Near Vision Inlay is a long-term solution for presbyopia, or near-vision loss. The quick, LASIK-like procedure takes less than 10 minutes and doesn’t require stitches as the eye heals on its own. To assist in the healing process and ensure optimal results, the patient will be sent home with drops to use over the course of the following few weeks and months after surgery. The procedure is typically completed in 10 minutes. Numbing drops are given for the procedure, but most patients do not experience any pain. 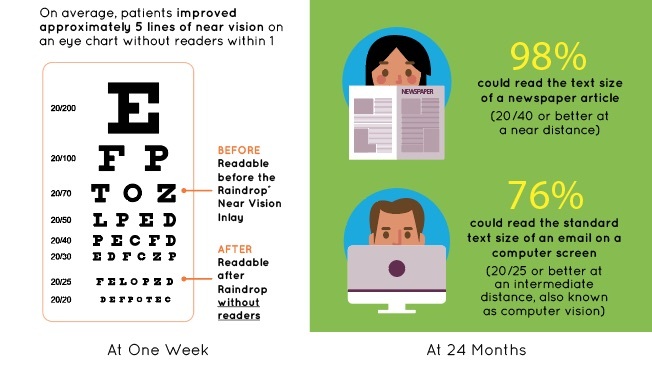 Whether you are a candidate for the Raindrop® Near Vision Inlay will ultimately be decided with your eye care provider, but here are some indicators that you might be a good candidate. If all the above applies to you, then you may be a great candidate for the Raindrop® Near Vision Inlay which can improve your near vision without glasses. 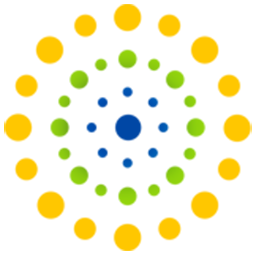 The best way to find out if you are a candidate is to locate a Raindrop specialist and make an appointment to be evaluated for the Raindrop® Near Vision Inlay. How will raindrop affect my distance vision? The Raindrop may decrease your distance vision in the Raindrop eye by approximately 1.2 lines, but with both eyes, your distance vision should not be affected. "What a life changer! I tested 20/20 near vision the next day! "Kelly - Patient of Dulles Eye Associates, Leesburg, VA.
Bill was 38 when he realized he had difficulty reading documents and his computer monitor. Julie was 45 when he could not see up close and can now see better after having Raindrop. Reesa experienced blurred vision at age 40 and now enjoys activities without glasses after Raindrop. can you guarantee I will see 20/20? The Raindrop® Near Vision Inlay may not eliminate the need for reading glasses. The Federal Trade Commission states, "As for promises of 20/20 vision — no doctor can make that guarantee". Further, the US Food and Drug Administration states:" Be wary of eye centers that advertise, "20/20 vision or your money back" or "package deals. There are never any guarantees in medicine." can the inlay ever be removed? Yes, the Raindrop can be removed and most patients go back to their vision before Raindrop. what is the inlay made of? It is a soft, biocompatible material, similar to a soft contact lens, which has similar properties and water content as the cornea. how is this different from monovision? The Raindrop Inlay improves near and intermediate* vision with minimal loss in distance vision in the implanted eye, unlike monovision that only corrects for either near or distance in each eye. Monovision is also a fixed point of vision with the potential of losing near vision as the patient’s near vision continues to worsen. *Intermediate vision was measured in the pivotal trial, but was not a study endpoint. There are non-surgical alternatives to the Raindrop® Near Vision Inlay, which include reading glasses or contact lenses. Be sure to include your questions and best number to reach you. Most all insurance is accepted. © 2018 shofnervisioncenter.com All rights reserved. Receive news updates and vision tips. Connect with us socially! We post news and information to help promote healthy vision.